We here at Exclaim! 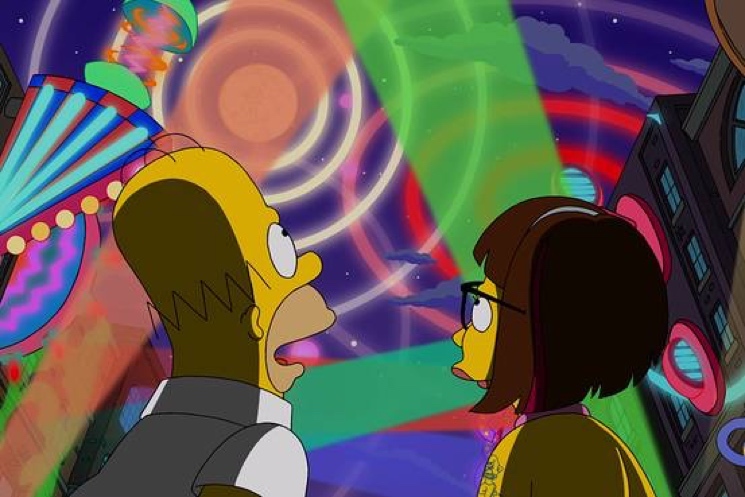 have already expressed some trepidation about The Simpsons being extended for a few more years, but here's at least one reason for viewers to feel excited that the long-running cartoon is still on the air: last night's episode (September 27) prominently featured Spacemen 3's space-rock classic "Big City (Everybody I Know Can Be Found Here)." This classic song from 1991's Recurring appeared during a scene in which Homer Simpson — having separated from Marge — trips out on drugs and alcohol while spending time with his new love interest, a Lena Dunham-voiced character named Candace. Episode writer J. Stewart Burns apparently chose the song, having recently learned of the band. Spacemen 3's Peter Kember (a.k.a. Sonic Boom) told the Wall Street Journal, "When I saw the script I was psyched. I couldn't imagine a sweeter use of that track in this context, and particularly in context of a 'trip' scene. [That is] something that's usually for me a high point of The Simpsons' oeuvre. I imagine it is what people in bands secretly, or openly, dream of. Animation is so useful for these sort of stretches of reality." Burns, meanwhile, said, "I would've expected this to at some point in the rewriting process somebody would have said 'Oh what's this song?' There are safer choices. I was a little surprised that no one ever yanked this one." The episode was titled "Every Man's Dream." Spacemen 3's soundtrack appearance wasn't the only notable music moment: the opening couch sequence featured a recreation of a few Beatles album covers.